You'll find these amazing brightly-colored FrontageFlags™ are a very affordable tool for attracting customers to your door! 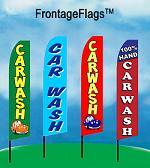 Our FrontageFlags™ are the best quality advertising flags you'll find on the market. What makes our FrontageFlags™ better than the rest? Built to withstand high winds over time: The heavy-duty fabric is a super-knitted 140kg polyester. Free-flying shape: At 11.5 feet tall and 2.5 feet wide, the top is curved, allowing the flag to fly freely and grab attention without wrapping around the pole. Easy to manage: The durable sewn sleeve is fashioned to slip easily over the flag pole. Original designs: Our graphic design staff develops unique designs that you won't see anywhere else. 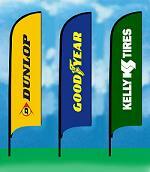 Ask about our custom flags. 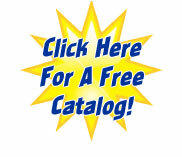 Click on the PDF link to the left for our complete selection and the latest really cool designs.